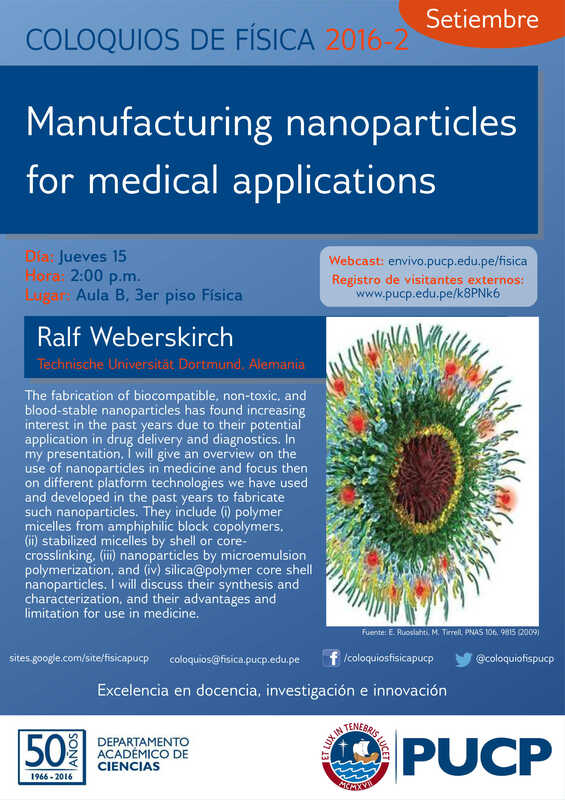 Ponente: Ralf Weberskirch (Technische Universitaet Dortmund, Alemania) The fabrication of biocompatible, non-toxic, and blood-stable nanoparticles has found increasing interest in the past years due to their potential application in drug delivery and diagnostics. In my presentation, I will give an overview on the use of nanoparticles in medicine and focus then on different platform technologies we have used and developed in the past years to fabricate such nanoparticles. They include (i) polymer micelles from amphiphilic block copolymers, (ii) stabilized micelles by shell or core-crosslinking, (iii) nanoparticles by microemulsion polymerization, and (iv) silica@polymer core shell nanoparticles. I will discuss their synthesis and characterization, and their advantages and limitation for use in medicine.